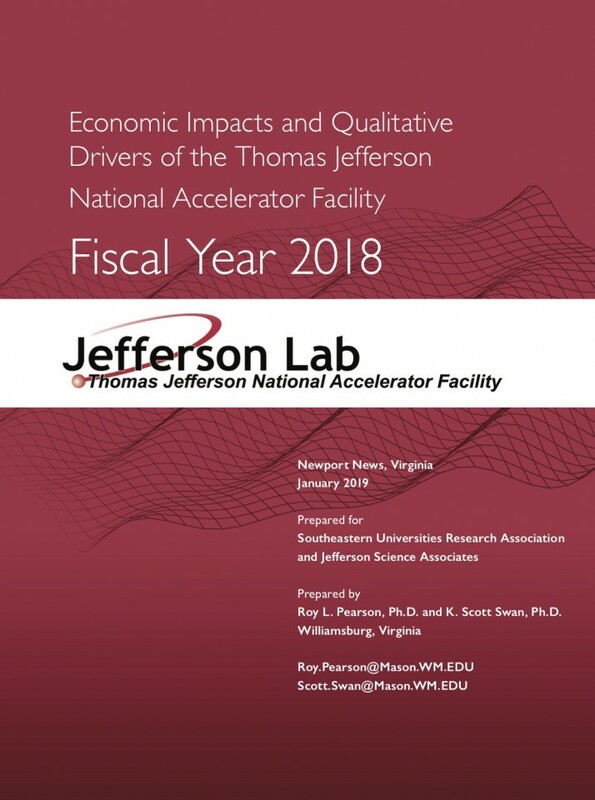 NEWPORT NEWS, VA. – A new study commissioned by the Southeastern Universities Research Association on the local, state and nationwide impacts of the U.S. Department of Energy's Thomas Jefferson National Accelerator Facility has found that the laboratory generated $556.9 million in output and provided labor income for 3,448 workers nationwide last year. “Jefferson Lab is a world-class facility with the primary goal of pushing the boundaries of our knowledge of what makes up our visible universe. However, we are proud that our pursuit of that mission has a positive impact on the economy at the local, state and national levels,” said Jefferson Lab Director Stuart Henderson. According to the study on fiscal year 2018 spending, the laboratory had a big impact on the Hampton Roads economy, with $269.1 million of total economic output. About $149.2 million of that was generated in labor income paid out to 2,015 area full-time and part-time employees. The study also found that about three-quarters of Jefferson Lab’s direct spending is in Hampton Roads. When including the Commonwealth of Virginia, Jefferson Lab’s economic output increased to $308.7 million, producing $168.3 million labor income for 2,240 job-holders. “The laboratory is also a great investment for U.S. taxpayers. According to this new study, Jefferson Lab returns to the economy more than three times what American taxpayers invest,” Henderson said. Jefferson Lab’s fiscal year 2018 budget was $162.4 million. The study attributes Jefferson Lab’s economic benefits to three major sources. The first is the direct spending by the laboratory, its contractors, the scientists who conduct their research at the lab, and its visitors. There are also the intellectual benefits to local universities, schools and communities that are derived from the laboratory’s research and outreach programs. Finally, there are the benefits that come from the commercialization of technologies developed at the laboratory for its science mission. Jefferson Lab is a U.S. Department of Energy Office of Science national laboratory. Scientists worldwide utilize the lab’s unique particle accelerator, known as the Continuous Electron Beam Accelerator Facility (CEBAF), to probe the most basic building blocks of matter - helping us to better understand these particles and the forces that bind them - and ultimately our world. The full text of the economic impact study can be found here. Contact: Lauren Hansen, Jefferson Lab Communications Office, 757-269-7689, lhansen@jlab.org.